By one of Cedar Ridge Arabians’ most noteworthy stallions, Brass and out of the Saddlebred mare Lady Vain, Ames Ragtime was a standout in both the halter and performance arenas. 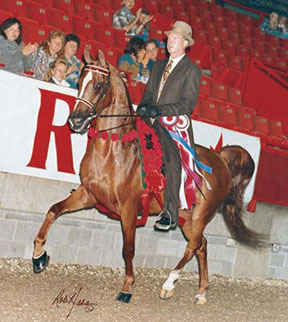 A 1992 chestnut gelding, he was first successful as a yearling, capturing the Region 10 Championship title in the Half-Arabian Yearling Colts/Geldings class. He followed that up with multiple regional titles before his performance career began in 1997. That year, he was Region 11 Champion Half-Arabian Gelding In-Hand Saddle/Pleasure type and Half-Arabian County English Pleasure Junior Horse. His wins in 1997 also included three Top Ten titles at Youth Nationals, two Canadian National Championships and Canadian and U.S. Nationals Top Ten awards. He was shown for another ten years, earning many regional and class A titles in the Country English Pleasure division.